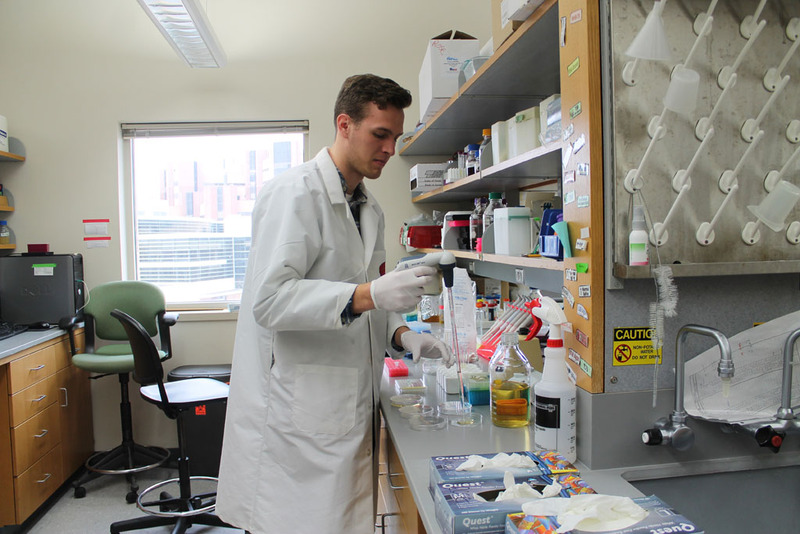 Aaron Rottier, a senior Pharm-Tox student, researches antibiotic resistance in the lab of Associate Professor Warren Rose, of the Pharmacy Practice Division. With diverse research opportunities built into its curriculum, the Pharmacology–Toxicology bachelor’s degree program offered by the University of Wisconsin–Madison School of Pharmacy is giving undergraduate students a critical advantage. By the end of four semesters of study, students have a solid foundation in basic research skills and are prepared for the types of research challenges that emerge in graduate school and in industry. “We strive to offer students in the Pharm-Tox program an interdisciplinary and research-driven curriculum, covering the breadth of basic science as well as depth in pharmacology and toxicology,” explains Jeff Johnson, a professor in the Pharmaceutical Sciences Division and director of the Pharm-Tox Program. Much of the Pharm-Tox students’ coursework is focused on basic foundational science, in addition to research in a broad range of biological and physical sciences that supports learning. “As a top-tier research university, we encourage our students to pursue research in whatever departments or areas interest them, including biochemistry, animal science, entomology, chemistry, and pharmaceutical sciences,” says Kendra Gurnee, Pharm-Tox program coordinator. Providing students with research experience early in their studies has a wide range of benefits. Students learn to work independently and with confidence, and they develop a clearer idea of their career goals. “My research experience has allowed me to explore different career pathways that I never knew existed prior to joining a lab,” says Charlotte Marie Urban, a junior at UW–Madison who is in her first year in the Pharm-Tox program. Urban is fulfilling her research requirements for her Pharm-Tox degree in the Department of Medical Microbiology and Immunology, where she is designing a gene editing system to create mutants of the parasite Toxoplasma gondii. She hopes that her research will shed light on genetic and metabolomic phenomena that could help improve the treatment of T. gondii infection, the cause of toxoplasmosis, a disease that can seriously damage the central nervous system. Left to right, Pharm-Tox students Aaron Rottier, Lauren Penn, Ly Hoang, Charlotte Urban, and Yusen Men. The Pharm-Tox faculty place high value on the participation of undergraduate students in research, such that research experience—involving tissues, cells, biochemical techniques, molecular biology techniques, or chemical synthesis—is a required component of the curriculum. Many students enjoy the research aspect of the program and ultimately take multiple semesters of research courses. Through their research projects, Pharm-Tox students also learn how to collaborate with professionals and help strengthen collaborations between the School of Pharmacy and other departments on the UW–Madison campus. Yusen Men, a UW–Madison senior and first-year student in the Pharm-Tox program, has made important research contributions for the laboratory of Hiroshi Maeda, an associate professor in the Department of Botany. Men is already published as a co-author in the journals Frontiers in Molecular Biosciences and Nature Chemical Biology for his research on the biochemical characterization of microbial enzymes of tyrosine biosynthesis to trace the origin of plants ADH enzyme. “Yusen Men has been doing exceptional work in my lab,” says Maeda, whose lab focuses on understanding the organization and regulatory mechanisms of plant shikimate and aromatic amino acid pathways—specifically defining the tyrosine biosynthetic pathway in plants. Lauren Penn, a junior and first-year student in the Pharm-Tox program, is carrying out research on fish endocrinology in the Department of Animal Science under the guidance of Professor Terence Barry. Penn’s research project is aimed at identifying components in the skin of yellow perch and determining whether those components influence behavioral or growth responses. While the Pharm-Tox program welcomes collaborative research endeavors, it also supports many students who use the research requirement to delve more deeply into the world of pharmacy, mainly through the School’s Pharmaceutical Sciences Division or Pharmacy Practice Division. Associate Professor Warren Rose (left), advises Pharm-Tox student Aaron Rottier in his research lab. Aaron Rottier, who will graduate from the Pharm-Tox program in May 2018, wanted to study a growing problem that has the potential to be a global public health threat: antibiotic resistance. Under the guidance of Pharmacy Practice Division Associate Professor Warren Rose, Rottier is investigating the antimicrobial mechanisms of currently approved antibiotics when used in combination together. This understanding, Rottier says, will help health care providers to select antibiotic combinations strategically to enhance the killing of the microbe and avoid the development of resistance. After graduation, he plans to begin medical school at the UW–Madison School of Medicine and Public Health. Hopefully, he says, he’ll end up in a career that consists of both seeing patients and continuing to participate in the research community to push health care forward. “The pre-exposure to this type and amount of material in my Pharm-Tox undergraduate courses has positioned me well to begin medical school with a strong base of knowledge and set of adaptable study skills,” says Rottier. “We try to answer patients’ questions in the lab, so Aaron’s research here will inform what he’ll learn in medical school,” adds Rose. Chitwood, in the lab of Associate Professor Charles Lauhon, who is also vice chair of the Pharmaceutical Sciences Division, is attempting to synthesize a multisubstrate analogue inhibitor of lysidine synthetase, which is a bacterial tRNA modification enzyme. Although this doesn’t sound much like Rottier’s work, the research is to the same end: fighting antibiotic resistance. While providing pharmacy undergraduate students with learning and research opportunities in both pharmacology-toxicology and a variety of scientific fields, the Pharm-Tox program is also preparing them for life on the road ahead. Through successes and failures, students learn how to problem solve and develop skills that help them adapt and create new courses of action. Such skills are not only valuable in academics and research but also are applicable to challenges Pharm-Tox students may face in other aspects of their lives. According to Penn, research experience provides key opportunities for skill-building, particularly when it comes to communication, teamwork, and attention to detail. These skills, she says, will help her in whatever field she intends to pursue. Pharm-Tox students (left to right) Lauren Penn, Aaron Rottier, Ly Hoang, Charlotte Urban, and Yusen Men. Such learning, research, and skill-building opportunities have proven to be greatly beneficial to Pharm-Tox undergraduates. 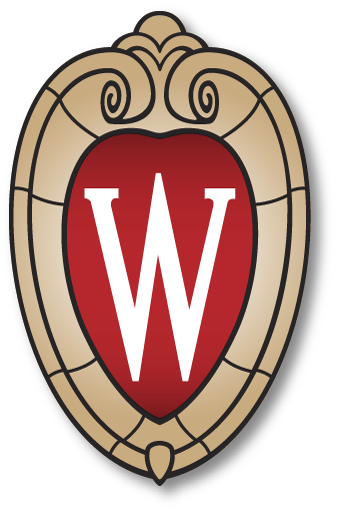 In 2017, Rottier and fellow Pharm-Tox students Sam Boroumand and Julia Chini, who currently are seniors at UW–Madison, were named UW–Madison Hilldale Undergraduate/Faculty Research Fellowship Awardees. Each student received $3,000 as part of the award, along with an additional $1,000 to offset research costs, leaving them well-poised for success in their academic and professional pursuits. A Pharm-Tox student has won the Hilldale Fellowship every year for the last four years. Since the mid-1980s, when the Pharm-Tox program was first developed, more than 360 students have graduated with a BS degree in Pharmacology-Toxicology from UW–Madison. Many of those graduates have gone on to earn a PharmD, PhD, or MD, and many have remained in academia, becoming professors in a wide range of fields, including chemistry, epidemiology, neuroscience, and toxicology. But academia isn’t always the goal, and Pharm-Tox students are highly qualified candidates for many industry roles at a wide range of companies. Of the 151 Pharm-Tox graduates between 2008 and 2017, almost one-quarter landed jobs in industry right after graduation, taking positions at companies such as S.C. Johnson, Millipore Sigma, and Promega Corporation. Learn more about the Pharm-Tox program at the School of Pharmacy or download a printable brochure. Read about Pharm-Tox alum Katherine Fallace’s career journey.